Got back from a rather pleasant family morning out to find my new Nexus 7 waiting for me. Always nice to start the holiday with a new toy. Getting into it wasn't as bad as the Youtube video might suggest, so I assume that Google have made things a little less snug than before. Setting it up is a dream: it takes minutes to configure and sign up to your Google account, and seconds to connect to the wireless. From opening to using took me less than 5 minutes: important if thinking about using these devices at an institutional level and therefore setting up hundreds. Much quicker than the iPad, that's for sure. The user interface is very nice indeed; the Nexus moves between apps smoothly with no discernable lag. I tried out a much cheaper 7″ tablet a while back and have to say that the Nexus blows it out of the water. It is as smooth as the iPad, which is saying something. The display is not retina, but because of the size of screen looks as bright and sharp as the new iPad. It has a few really nice touches that work intuitively and cleverly – swipe down for the Android version of notification centre (called the notification shade), swipe up for Google Cards, which are personalised to you (for example, when you're about to leave for work you can swipe up to see the traffic information for your journey home). Within the notification shade you can toggle screen rotate on and off – personally I think the Nexus works best for all but word processing in portrait mode. And this is where I think the Nexus beats the iPad – it is so nice to hold. 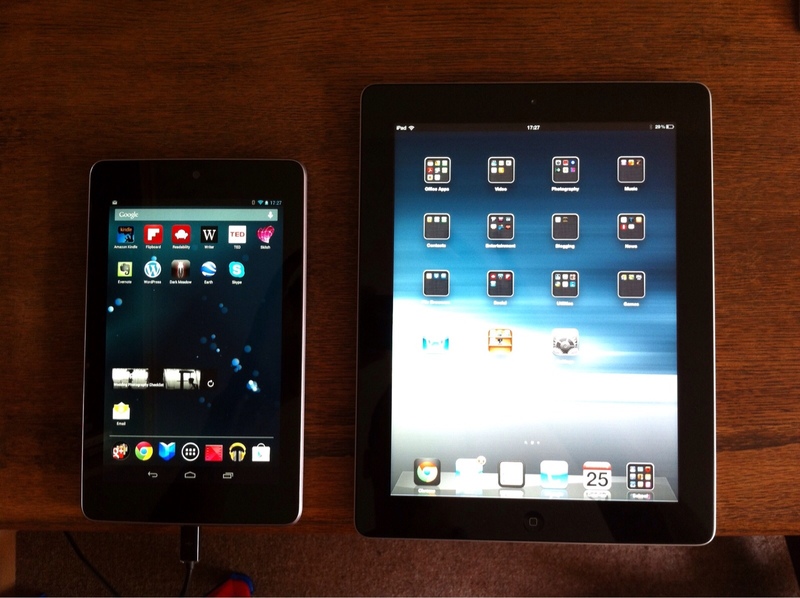 It fits far better into one hand than the iPad, leaving the other hand free to navigate. The page size on the internet is decent enough, and for things like email and books it is spot on. For students, I can genuinely say that the Nexus could well be a better device. And it fits into a decent sized pocket, which is more than you can say for the iPad. There are other nice features, such as the face detect unlock (great for kids who are rubbish at remembering passcodes) and your play library on one page. It seems, on first look, to do everything you'd want a device for schools to do. And all for about a half of the price of the iPad. Will we be getting them for next year's 6th formers? The answer is a resounding yes. Particularly if the current offer of £15 worth of Play.com credit continues, as this will mean students being able to get the apps they need for nowt. Next PostA chance to help parents? My brother’s school has forked out for a load of iPads and whilst I think it is great they are embracing this technology I couldn’t help thinking to myself – if you picked a different brand twice as many students could benefit.